Consciously uncoupled Gwyneth Paltrow wishes son Moses a happy 8th birthday with her wedding ring prominently displayed. 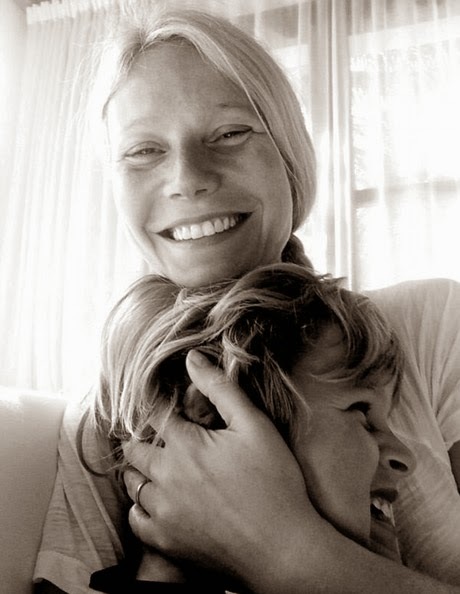 Gwyneth Paltrow shared a sweet black and white Twitter snapshot of herself cuddling son Moses in honor of his birthday today, but what caught our attention was the fact she was wearing her wedding ring for the second day in row! "Moses Bruce Paltrow turns 8 today. We love you!" she captioned the photo. Although the Oscar winner and husband Chris Martin announced their "conscious uncoupling" on March 24, she was spotted wearing her bauble while riding passenger around her Brentwood neighborhood just yesterday as well. Rumor has it the Coldplay front man is eager to make it work, so maybe GP is deliberately sending a message things aren't totally irretrievable between the two? "Chris still loves Gwyneth and would still like the marriage to survive. He hopes they might be able to rediscover what they had years ago and would love to rebuild their relationship back to what it once was," a source told Sunday Mirror. Is a conscious re-coupling coming next?